Brush up on your skills and get back on the water with confidence! Whether you are looking to review basic cruising skills or just wanting an instructor-lead course to gain additional on-the-water experience, our “Mileage Builder” course will fit your needs. These classes may be customized such that each student on board can focus on those skill they wish to develop. Practice your points of sail, tacking & gybing, boat handling manoeuvres, docking, anchoring, crew overboard, sail trim, larger boat handling and more! Available in daytime or live-aboard overnight formats. 1 or 2 Day (daytime) Refresher Courses: Are your sailing skills a little rusty? Perhaps you have just finished a Basic Cruising course but still need some additional time with an instructor to feel more confident? This 1-day or 2-day on the-water-course will allow you to quickly fill in the knowledge gaps and give you the chance to practice a number of keelboat basic cruising skills. Live-Aboard Mileage Builder: Perfect for sailors who want to gain further sailing experience in preparation for owning a sailboat or taking the Intermediate Learn-to-Cruise course. Learn and relax while improving your seamanship skills with an emphasis on safety, navigation, and proper on-board procedures. Your experience on this cruise will also prepare you for bareboat chartering on a larger boat. 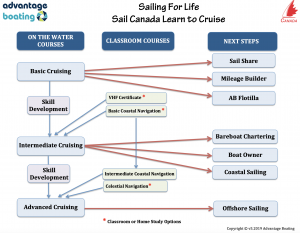 PREREQUISITE: Sail Canada Basic Cruising (Skipper) Standard or the equivalent experience. Recommended that you also have VHF Radio and Sail Canada Basic Coastal Navigation Standard if taking the live-aboard course.